Crochet Hook G (4.00 mm). A Tunisian hook isn’t necessary for this project. Tunisian Simple Stitch (tss): View a tutorial on this stitch here. Tunisian crochet has two steps: the forward pass and the return pass. In this pattern, the return pass is always the same. Return Pass: yarn over, pull through first loop, (yarn over, pull through 2 loops on hook) across. Tunisian Simple Stitch Decrease (tss dec): Insert hook through next two vertical bars, yarn over, pull up a loop. Gauge Swatch: 2″w x 2″h (5 cm x 5 cm) ch 9. Row 3-8: Repeat Row 2. Measure around your head and subtract 4″ (7.5 cm) from that measurement. Repeat Row 3 until the headband matches that measurement. Row 5: Bind off by slip stitching into the 2 vertical bars. Continue sl sts down the long side of the headband until you reach the starting chain. Sl st 2 into the starting chain. Continue sl sts up the other long side of the headband. Invisible join to first sl st. Finish off. Invisible join to first dc of Round 3. Leave long tail for sewing. Finish off. 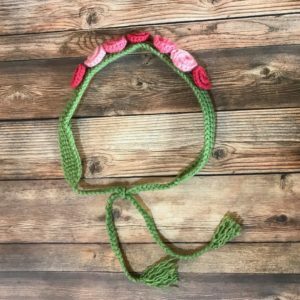 When you’ve made all the flowers, space them out and sew them to the headband with a yarn needle. I spaced the flowers 5 rows apart from each other. To make the headband tassels, cut 3 strands of yarn that are each 12″ (30 cm) long. Fold them in half and attach them to one end of the headband like you would attach fringe to a scarf. Braid the strands and tie a knot at the end. Repeat on the other side. Need help while crocheting? Feel free to leave a comment below and I’m happy to help! 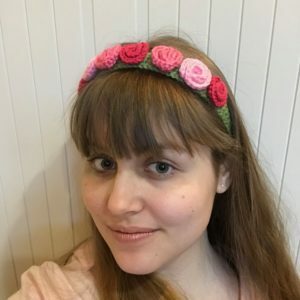 This entry was posted on Monday, March 18th, 2019 at 9:02 AM by Claire Golden	and is filed under Free Crochet Patterns. You can follow any responses to this entry through the RSS 2.0 feed. You can skip to the end and leave a response. Pinging is currently not allowed. I love floral headbands, and perfect for spring! So pretty! Thank you very much, Amy! Flowers make me smile, I’m so happy they’re starting to bloom. This is such a pretty flower crown! Thank you for sharing. Thank you Erica, I’m happy you like it! It’s always my pleasure to share anything with crochet flowers, they make me smile.